The Alliance for the Advancement of People’s Rights (Karapatan), a human rights group in the Philippines, has already documented six extrajudicial killings in 2014. According to Karapatan, from July 2010 to August 2013 there were 152 extrajudicial killings, eighteen enforced disappearances, eighty instances of torture and 168 unsuccessful assassination attempts. The headlines are focusing on the recent peace agreement between the central government in Manila and separatists in Mindanao, but the US press in particular has largely ignored these human rights violations, which are taking place in an increasingly militarized environment. Both the Philippine government and the United States have used the maritime disputes with China and the alleged prevalence of terrorists on the islands as a pretext to justify US support for the Philippine military as well as additional US troop presence in the area. The humanitarian disaster created by the typhoon has also provided an opening for the militaries of both countries to amplify their role at the expense of civilian actors. In 2002, as part of the US-initiated “global war on terror,” the Philippine government launched the counterinsurgency plan Oplan Bantay Laya (Operation Freedom Watch), a holistic approach to counterinsurgency aimed at all manner of opposition activists in the country. The plan made no distinction between armed combatants and civilians. Regions where the plan was implemented saw escalating numbers of civilian killings, including many members of leftist popular organizations that the government alleged to be “Communist fronts.” The attacks were not limited to political party activists but extended to lawyers and judges who had been involved in human rights work or cases where government interests were at stake. Killings of other government critics similarly escalated. Between 2001 and 2007, hundreds of activists with progressive organizations were murdered, including trade union leaders, human rights activists, journalists, church workers, indigenous leaders, civilians, farm workers and peasant leaders. In 2006, the worst year for human rights since the toppling of the right-wing Marcos regime in the 1980s, the Philippine military and its paramilitary death squads killed an average of one activist every thirty-six hours. The Supreme Court called for the establishment of ninety-nine special courts to prosecute the killings by June 2007. The Arroyo government created several investigative bodies, including the Melo Commission. But human rights groups in the Philippines have suspected that the government was using these mechanisms merely to exonerate the military and police perpetrators. Despite statements of concern as well as reports by the UN (including findings by the Human Rights Committee), human rights organizations, international observers and the Arroyo government’s own commission, the killings continued unabated, and victims and their families were left without justice. The Philippine government continues to commit human rights violations with impunity. According to Karapatan, President Aquino’s implementation of the counterinsurgency program Oplan Bayanihan (Operation Shoulder to Shoulder) has thus far resulted in 152 documented cases of extrajudicial killings, 168 attempted killings, eighteen instances of forced disappearance, eighty cases of torture, 608 cases of illegal arrest and more than 30,000 forced evacuations. General Palparan faces a 2011 warrant of arrest from a Bulacan court for his involvement in the 2006 disappearance of two student activists in Central Luzon. He is still in hiding, probably with the assistance of the Philippine armed forces. Palparan is regarded as the key implementer of Oplan Bantay Laya and was promoted by Arroyo at the height of the extrajudicial killings and forced disappearances. The promotion of military generals who are known human rights violators is an indication of the persistent climate of impunity under the Aquino administration. The military, private armies and paramilitary units silence independent media outlets and journalists with impunity. Journalists face rampant vandalism of their offices, constant intimidation and surveillance, and abduction and killings. In December 2013, Rogelio Butalid, a block-timer for 107.9 FM Radyo Natin, was shot dead by a lone killer in Tagum City in Davao del Norte province shortly after he finished his radio program. That same month, radioman Michael Milo was gunned down in Tandag City in Surigao del Sur province. This has also affected US citizens active in Philippine solidarity, as evidenced by the 2009 abduction and torture of BAYAN USA member and Filipina-American activist Melissa Roxas by the Philippine military. Roxas has filed complaints with the US State Department and the UN Special Rapporteur on Torture, in addition to exhausting the domestic court system in the Philippines. Lawyers and human rights groups providing counsel to activists imprisoned on trumped-up charges have become targets of repression themselves. They are subject to extrajudicial killings, violent harassment, illegal detention and surveillance by a state apparatus keen to silence dissent. For example, Army chief Lt. Gen. Noel Coballes recently named the human rights organization Karapatan an “enemy of the state” for its objection to the promotion of Brig. Gen. Aurelio Baladad. Baladad faces a string of credible charges, including the illegal arrest of forty-three community health workers in a dawn raid in Morong by a swarm of Philippine Army and police personnel just before Arroyo’s term ended. Leaders of people’s organizations are also facing criminal charges over a protest held during President Aquino’s State of the Nation address last July. According to NUPL, in the course of negotiating with police representatives for a resolution to the impasse, the police suddenly attacked protesters, hurting scores of people—including the NUPL secretary general. The Philippines, a US colony for the first half of the twentieth century, is considered a key strategic partner for US economic and strategic interests. The large Subic and Clark military bases, for example, played a key role in the Vietnam War. In return, from 1972 to 1986, the United States supported the Marcos military dictatorship with massive economic and military aid. But in 1998, Washington and Manila signed a Visiting Forces Agreement (VFA), which allowed the United States to establish twenty-two “semi-permanent” bases in the archipelago to get around the ban that opposition to US bases had prompted. Former US ambassador to the Philippines Thomas Hubbard signed the VFA as an executive agreement rather than a treaty, eliminating the need for the advice and consent of the US Senate. Foreign Secretary Domingo Siazon signed the VFA on behalf of the Philippines, and the Philippine Senate ratified the agreement. After the 9/11 attacks, President Arroyo was one of the first heads of state to pledge support to President George W. Bush’s “war on terror.” Since 2002, the Joint Special Operations Task Force Philippines, which comprises about 500 members of the US military, has been stationed at a “temporary” base in the southern Philippines. Constitutional challenges to the VFA by human rights lawyers have been thus far unsuccessful. On June 27, 2013, Philippine Defense Minister Voltaire Gazmin and his Japanese counterpart announced that the Philippines would be establishing basing arrangements with both the United States and Japan, which would increase the US troop presence in the Philippines. Human rights lawyers quickly pointed out that the arrangement would circumvent the constitution and the VFA. In early November, disagreements between US and Filipino negotiators prolonged the talks on the increased American troop presence. 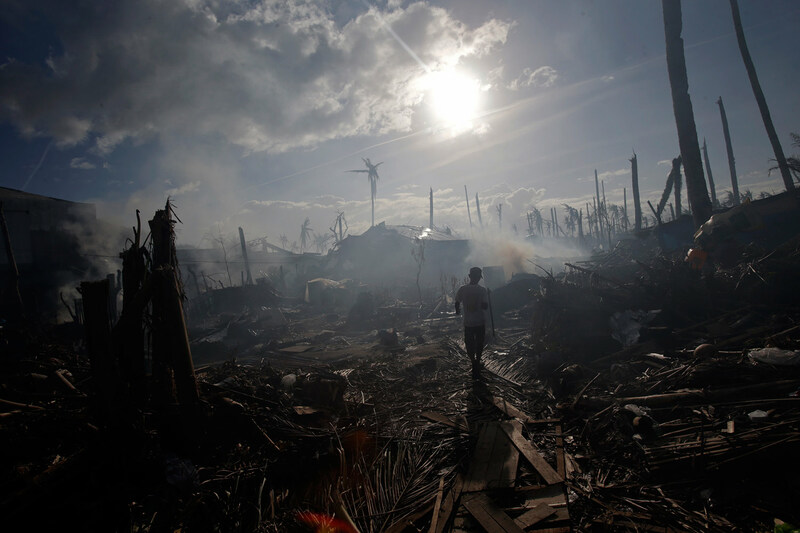 But after Typhoon Haiyan, both Manila and Washington are justifying more US troops as part of humanitarian aid missions, and negotiations are back on track. The Philippines, one of the closest US allies in Asia, is crucial to the Obama administration’s “pivot” to Asia, which aims to counter the rising influence of China on the world stage. The United States provided more than $507 million in military assistance to the Philippines from 2001 to 2010. After pressure from human rights groups inside the Philippines—which were supported by international efforts to bring attention to extrajudicial killings, disappearances and other human rights violations—US military aid decreased and the United States withheld the release of some military financing. A March 2007 Senate hearing resulted in the cutting of a portion of the 2008 Foreign Military Financing package to the Armed Forces of the Philippines due to the latter’s involvement in human rights abuses. American funding was down to $11.9 million in 2011. It is on the rise again, however, and along with it there has been a dramatic increase in human rights violations against activists, many of whom are farmworkers, peasants and indigenous people opposed to the incursions of multinational corporations and the theft of their land. The most recent incident happened on February 5, when two unidentified men onboard a red motorcycle shot and killed 41-year-old peasant leader Julieto Lauron, who was with organizer Nermie Lapatis on their way to the village of Haindangon, Valencia City. Lapatis had recently moved to Valencia City because of threats against her life. As an organizer among indigenous peoples in Bukidnon, Lapatis campaigned against the entry of large-scale mining companies in the area, earning the ire of the military and paramilitary groups. Military aid in 2012 rose to $30 million, and the Philippine foreign ministry recently announced that the United States has increased the military assistance package to about $50 million for the next fiscal year. This comes as Philip Goldberg, who returned to the United States after the Bolivian government expelled him and President Evo Morales declared him persona non grata for “conspiring against democracy and seeking the division of Bolivia,” was recently appointed US ambassador to the Philippines. Together, these developments signal the US government’s renewed support for Oplan Bayanihan, the Aquino administration’s latest attempt to end a forty-five-year-old insurgency led by the Communist Party of the Philippines and its armed wing, the New People’s Army (NPA). Oplan Bayanihan has adopted a similar framework and similar techniques to Oplan Bantay Laya, and has led to human rights violations. These techniques include smearing all opposition activists as Communists and treating them no differently than the NPA. Systematic human rights violations are also being committed in the very same places where foreign interests are currently operating or exploring new ventures in highly destructive industries such as open-pit mining, cash-crop agriculture, oil and gas extraction and logging. For example, Human Rights Watch has documented cases in which critics of mining and energy projects have been killed, allegedly by paramilitary forces under military control. The activists had been vocal in opposing mining and energy operations that they said threatened the environment and would displace tribal communities from their land. These include the southern Philippine island of Mindanao, where massive amounts of oil and natural gas have been found. The island also plays host to lucrative plantations for large corporations like Dole and Del Monte. Karapatan reported in December that since President Aquino assumed power in 2010, twenty-five people, most of them political activists and three of them children, have been killed in southern Mindanao. American military aid to the Philippines violates US laws regulating aid to human rights-violating militaries. The US Arms Export Control Act, as well as the Leahy Law, stipulates that no funding shall be furnished to foreign security forces if the United States has knowledge that those forces have committed “a gross violation of human rights.” Yet human rights violations committed by the Philippine military do not currently affect the frequency or quantity of US military aid provided to the Philippines. Human rights groups in the Philippines, such as Karapatan, have called for an end to US military involvement that “violates the sovereignty of the Philippines and perpetuates the culture of impunity” for rights abusers. As Americans, we must ask why the US government is sending millions of taxpayer dollars to the Philippine military at the same time this institution is committing systematic human rights violations. American military involvement in the Philippines must end. Vanessa LucasVanessa Lucas is a partner at the law firm of Edelstein & Payne in Raleigh, North Carolina. Her practice focuses on civil rights and employment law. Lucas, who is chair of the National Lawyers Guild Philippines Subcommittee, first visited the Philippines in 2006 as part of a delegation of women human rights lawyers.